We wish all our clients a very Merry Christmas and a safe and Happy New Year. Thank you for your business in 2016 and we look forward to working with you again in 2017. Our last distribution for the year will take place from 17th-21st December 2016. Stock for this distribution MUST be in our office no later than Wednesday 14th December 2016. Any stock received after 15th December, will go out in the new year. Our first distribution for 2017 will start on Tuesday 3rd January. Stock for this distribution MUST be in our office no later than Wednesday 21st December 2016 so we can have it all counted out and ready for the team to pick up in the New Year. Our Office will be closed from noon on Friday 23rd December 2016 and reopen 8.30am on Tuesday 3rd January 2017. This will enable our office staff to take a well-earned break. From Sue, Bruce, Merv and Mark. Back in October 1996, David McHarry was delivering flyers and leaflets for a Brisbane based pamphlet distribution company. By December 1996, David and his wife Sue, were asked to be Toowoomba Supervisors for that company. In March 1997 David became the Toowoomba Sales representitive. Due to unforeseen circumstances the Brisbane company closed down in August 1997 and the Managing Director encouraged David and Sue to go out on their own. Due to a lack of experience and confidence, they went into partnership with a Canberra based company. They learnt a few lessons and August 1998 that partnership was dissolved and they began Darling Downs Pamphlet Distributors in its own right. With no financial backing of any sort, they grew the business the hard way. They moved their operation from a 6 X 12 verandah in Clifford St in 1997 to a double garage in Barrymount Crescent Toowoomba. With continued growth, they soon out grew the garage and in October 2000, they re-located into commercial premises on the corner of North and Parrot St where they operate from today. In November 2003 they formed a Proprietary Limited company with David as the Director. Unfortunately David passed away in late January 2009 and Sue has now taken over the role as Director and runs the business with the help of her loyal staff. Today Darling Downs Pamphlet Distributors Pty Ltd employs 4 staff and over 150 subcontractors across the Darling Downs including supervisors and teams in nearby towns such as Warwick and Dalby and all the little towns in between. 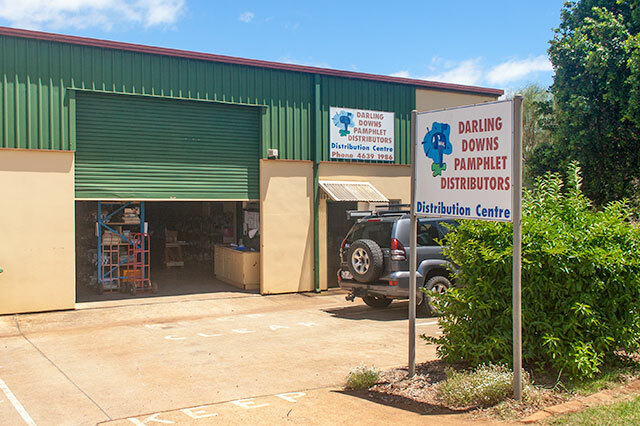 Now, nearly twenty years on, Darling Downs Pamphlet Distributors Pty Ltd is still the largest locally owned and operated pamphlet distribution company west of Brisbane.